All the wrestlers have profiles on the site, you can click on their name to go straight to it. Since this aired on Stardom World, all matches are shown in full. As one would expect, the show starts with a Rookie Battle! All four of these wrestlers are rookies, with three of them being children. The one exception is Shiki Shibusawa, but she is also the least experienced as she just debuted last week. No idea who will ‘lead’ this one, probably Hanan, she’s the most polished of the bunch. Hanan and Starlight Kid start off, they go through a sequence off the ropes but they reach a stalemate. Shiki comes in briefly to help Starlight Kid get the advantage, Starlight Kid tags in Shiki and Shiki puts Hanan in a crab hold. Hanan gets to the ropes to force a break, scoop slam by Shiki and she puts Hanan in a sleeper. Hanan slides out of it and they trade front necklocks, Shiki goes off the ropes and she dropkicks Hanan to the mat. Another dropkick by Shiki and she covers Hanan for two. Shiki goes off the ropes but Ruaka grabs her, but Starlight Kid grabs Hanan too. STO by Hanan to Shiki, and she gets a two count cover. Hanan tags in Ruaka, Ruaka goes for the big boot but Shiki moves out of the way. Reverse STO by Ruaka to Shiki and she nails the big boot in the corner, she goes for a fisherman suplex but Shiki blocks it. Hanan and Starlight Kid both come in, Hanan is knocked out of the ring and Starlight Kid hits a standing moonsault onto Ruaka. Missile dropkick by Shiki, but Hanan breaks up the cover. Shiki tags Starlight Kid, Starlight Kid goes for a crossbody but Ruaka catches her and throws Starlight Kid to the mat. Tiger Feint Kick by Starlight Kid but Ruaka mostly blocks it, Ruaka and Starlight Kid trade elbows until Ruaka hits a side Russian leg sweep. Ruaka tags Hanan, dropkicks by Hanan to Starlight Kid and she covers her for two. Hanan and Starlight Kid trade waistlocks, Shiki comes in but she dropkicks Starlight Kid by accident. Ruaka boots Shiki while Hanan throws Starlight Kid to the mat. Fisherman suplex by Ruaka to Starlight Kid, Hanan goes off the ropes and she hits Starlight Kid wit a STO for a two count. Hanan goes off the ropes but Shiki trips her from the floor, Tiger Feint Kick by Starlight Kid to Hanan, and she hits a standing moonsault. Starlight Kid gets on the second turnbuckle and hits a diving crossbody, cover by Starlight Kid and she picks up the three count! Shiki Shibusawa and Starlight Kid win! Some definite miscommunications but considering their experience levels that is to be expected. Its hard to criticize a bunch of wrestlers with less than a year of experience (some much less than a year), its all a learning process. Some good spots and a few of them show some early promise, but I wouldn’t say it was a good match. Team Jungle vs. Gaijin Invaders! Kaori Yoneyama joined up with Jungle Kyona’s posse in the spring, she teams here with the rookie Natsuko Tora. On the other side, this is Xia Brookside’s first tour in Stardom while Gabby Ortiz has been hanging out in Stardom since June. Hopefully Xia and Gabby will get a bit more of a chance to show off, since neither were a big part of their tag match on July 16th. Team Jungle attacks before the match starts and attack both of their opponents in the corner. Double body block by Team Jungle, scoop slam by Natsuko on Xia and she slams her a couple more times. Xia elbows Natsuko and hits a dropkick, she tags in Gabby and they hit a double face crusher onto Natsuko. Gabby picks up Natsuko and hits a flipping neckbreaker, dropkick by Gabby and she covers Natsuko for two. Stretch hold by Gabby, Kaori comes in to help but Xia puts her in an Octopus Hold. Irish whip by Gabby to Natsuko but Natsuko hits a shoulderblock and tags in Kaori. Kaori boots Gabby in the head, Xia comes in but Kaori hits a crossbody onto both of them followed by a senton. Kaori picks up Gabby and they trade strikes, back elbow by Gabby and she tags in Xia. Xia goes off the ropes and hits a spinning headscissors onto Kaori, jumping knee by Xia and she hits a face crusher for a two count. Northern Lights Suplex by Kaori and she tags Natsuko, shoulderblocks by Natsuko and she covers Xia for two. Gabby comes in but Natsuko hits a spear onto both of them, another spear by Natsuko to Xia and she covers her for two. Kaori comes in and gets on the second turnbuckle, but Xia avoids her diving senton. Xia tosses Natsuko off the top turnbuckle and applies the Japanese Leg Roll Clutch, picking up the three count! Team Jungle wins the match. Pretty short, just a hair over six minutes, so still not a great look at the wrestlers new to Stardom. I was surprised to see Xia pick up the pinfall, not sure if they have something in mind for her or if they just didn’t put too much thought into a midcard house show match. Solid action, and Kaori looked great as she tends to, but too short to recommend. We have reached the last of our trio of rookie matches to kick off the show. AZM isn’t actually a rookie as she has been wrestling for three years, but since she is only 14 years old she is frequently still considered a rookie. She is the junior member of Queen’s Quest and has two trio title reigns under her belt, but she hasn’t had much success yet as a singles wrestler. Neither has Hiromi, she also has had success in trios but besides that is still trying to work her way up the card. So a pretty even match in regards to experience and size, however Hiromi is 17 years older which will give her an edge. They get right to it as AZM quickly gets Hiromi to the mat and dropkicks her, AZM throws Hiromi into the corner and connects with another dropkick. Footstomps by AZM near the ropes and she puts Hiromi in a camel clutch, she lets Hiromi up but Hiromi delivers a dropkick. AZM tosses Hiromi out to the apron but Hiromi elbows her back, she returns to the ring but AZM hits a satellite cradle for two. AZM and Hiromi trade elbows, sunset flip by AZM but Hiromi rolls through it and hits a crossbody for two. AZM blocks a suplex and hits rolling verticals for two, she jumps on Hiromi’s back but Hiromi shrugs her off and applies La Magistral for a two count. Hiromi goes off the ropes and delivers a DDT, she charges AZM in the corner but AZM moves and cradles her for two. A backslide by AZM gets a two count as well, she goes for the Japanese Leg Roll Clutch but Hiromi blocks it. The two trade flash pins, until Hiromi is able to hold down AZM for the three count! Hiromi Mimura is the winner! This match was even shorter, but I am not complaining since these are not two of the better in-ring wrestlers in Stardom. I am not sure what the long term plan can be with either, AZM is still a kid but Hiromi hasn’t improved much in the last year and her last singles win in Stardom (which was also against AZM). The flash pins I guess were done well and nothing stuck out as bad, just nothing was particularly memorable. Short and inoffensive. Now this is a unique match-up if I have ever seen one. Mari Apache has joined Stardom for a few months, she’ll be around until the fall so expect more bigger matches from her. She’s a respected luchadora known for her work in AAA and hits hard, so she brings something a bit different to the promotion. Shanna has become a bit of a Stardom regular as well, and won her first title in the promotion the week before when she defeated Kris Wolf for the High Speed Championship. This is a non-title match, and a rare gaijin vs. gaijin singles match for the promotion. Shanna hits the first big move of the match with a hurricanrana, dropkick by Shanna and Mari rolls out of the ring to re-group. She returns after a moment, Shanna goes for another dropkick but Mari avoids it and hits a backbreaker. Mari puts Shanna in the Mexican Surfboard while rolling her around the ring, modified STF by Mari but Shanna gets a hand on the ropes for the break. Kick by Mari in the corner but Shanna snaps off a hurricanrana for a two count. Mari pushes Shanna against the ropes and boots her in the head, heel drop by Mari and she covers Shanna for two. Camel Clutch by Mari, she lets go of the hold after a moment and puts Shanna in a single leg crab hold. Shanna eventually gets to the ropes, stomps by Mari and she puts Shanna on the top turnbuckle, but Shanna kicks her back and hits a diving hurricanrana. Stunner by Shanna, and she covers Mari for a two count. Shanna puts Mari in a cross armbreaker but Mari gets a foot on the ropes for the break, Shanna picks up Mari but Mari rocks her with a lariat. Sit-down powerbomb by Mari, but Shanna gets a shoulder up on the cover. Elbow by Shanna and she delivers a high kick, sending Mari rolling out of the ring to the floor. Shanna gets a running start and dives out onto Mari with a tope suicida, but Mari grabs her and stomps Shanna in the head. Mari throws Shanna into the chairs at ringside but Shanna returns the favor, Shanna goes to re-enter the ring but Mari grabs her from behind as they take turns trying to get back into the ring. Neither can make it however in time, as the referee reaches a 20 Count with both still on the floor! The match is a Double Count Out. I was enjoying this until the overly telegraphed ending. Its always suspicious in Stardom when the referee is obviously counting since Stardom wrestlers are known for taking forever on the floor without the referee caring. Plus the spots with both wrestlers pulling each other by the leg to prevent the other from getting back in weren’t very well done. Up to that point it was a pretty fun match, a bit mat-based but Mari has some quality submissions so it was entertaining. Impressed that Shanna managed to squeeze three hurricanrana variations in such a short match, but it was more a Mari match than a Shanna match in structure. Above average overall, the ending was just a bit lame. Grudge match! Almost immediately upon returning to Stardom last fall, HZK started feuding with Kyona since they are on the same basic level. Even though they debuted at different times, their experience is similar and of all the younger wrestlers in the promotion they fit best as a ‘generation feud’. Kyona is a few years older however and has had more success in-ring in Stardom, so HZK still has to catch back up a bit. On the plus side, at least they are moving on from having them team up like they did last week, as they work much better as true rivals. HZK asks for a knuckle lock to start, which Kyona accepts, and they go into a Test of Strength. They both end up on the mat while still locked up, they get back on their feet and HZK gives Kyona a hard headbutt. Both are staggered but recover at about the same time, hard shoulderblock by Kyona and she hits a second one. Cover by Kyona, but it gets a two count. Kyona throws HZK into the corner but HZK catches her with a dropkick, HZK tosses Kyona into the corner and gives Kyona some bootscrapes. Running boot by HZK and she kicks Kyona in the back, more strikes by HZK but Kyona keeps fighting back. Kyona gets HZK’s back and puts her in a sleeper before spinning her around, Kyona keeps the hold applied on the mat. HZK manages to get back to her feet and falls backwards to get Kyona off of her, running elbow by HZK in the corner and she covers Kyona for two. Kyona goes for a powerbomb but HZK gets out of it and kicks Kyona in the head before jackknifing her for a two count. Hard lariats by Kyona but HZK ducks one and hits a release German. HZK nails the Pump Kick, she picks up Kyona and hits a backbreaker in front of the corner. HZK goes up top and delivers the diving senton, but Kyona gets a shoulder up on the cover. She goes up top again but Kyona recovers and joins her, they trade elbows until Kyona powerslams HZK off the top down to the mat. Kyona picks up HZK but HZK snaps off a DDT, they trade elbows as they return to their feet until Kyona levels HZK with a lariat for a two count. Kyona goes up top and delivers the diving body press, but she gets another two. Kyona deadlifts HZK up and nails the Hammer Throw Powerbomb, and she picks up the three count! Jungle Kyona wins the match. This match is the only reason I am watching this show in the first place, not because the other matches didn’t have potential, but sometimes it takes something special to get me to sit down and watch a show with so much Joshi available these days. Michiko Omukai is one of the best Joshi wrestlers ever that no one talks about, since her best matches were in ARSION which no one really discusses in 2017. But she was a really high end wrestler, she officially retired in 2007 but this match came about because her kids are big fans of Stardom. So somehow that turned into her agreeing to have this match, so that her children could see her wrestle with and against their favorite wrestlers. Oedo Tai is the playful heel faction in Stardom, but with a fair amount of success lately as Hana and Kagetsu hold the Goddesses of Stardom Championship. But this is mostly about Omukai, really looking forward to seeing her after all these years. Oedo Tai attacks before the bell and knocks all of their opponents out to the floor, they quickly join them as the brawl spills to ringside. Kris pairs up with Omukai but it doesn’t go well for her for long as Omukai quickly gets the advantage. Konami and Kagetsu eventually return to the ring as the legal wrestlers, and all the members of Oedo Tai attack Konami near the apron. Dropkick by Kagetsu to Konami, she tags in Hana and Hana chops Konami in the corner. Kris is in next, she sets up Konami in the corner and dropkicks her in the midsection. Kagetsu returns and spits water (I assume) into Konami’s face, kicks by Kagetsu but Konami delivers a kick of her own and makes the tag to Omukai. Omukai boots Kagetsu and knocks Kris out of the ring, she goes back to Kagetsu and throws her down by the hair. Bito comes in and they double team Kagetsu, Konami comes in too and all three pose on their opponent. Konami stays in and kicks Kagetsu, dropkick by Konami and she goes for Kagetsu’s arm, but Kagetsu slams her into the corner. Konami applies a hanging armbar and dropkicks Kagetsu, she goes for a suplex but Kagetsu reverses it with a suplex of her own and tags in Hana. Hana hits a jumping knee on Konami before delivering a dropkick, running boot by Hana and she covers Konami for two. Hana picks up Konami but Konami sneaks in an inside cradle for two. Konami tags in Omukai, Hana elbows her but Omukai elbows her back and they trade shots. Omukai wins the battle, she kicks Hana in the back but Hana boots her and both wrestlers end up down on the mat. Omukai tags in Bito while Kris is also tagged in, vertical suplex by Bito and she covers Kris for two. Bito goes off the ropes but Kagetsu trips her from the floor, she comes in the ring and Bito is triple teamed in the corner. Bito fights off all three of them but eventually eats a triple dropkick, spear by Kagetsu and Hana dropkicks Bito against the ropes. Suplex by Kris, and she covers Bito for two. All six wrestlers end up in the ring, Bito eventually regains the advantage and hits a missile dropkick onto Kris. Cover by Bito, but Kris gets a shoulder up. Kris and Bito trade elbows, Bito knocks Kris to the mat and she hits a dropkick. Hana comes in and boots Bito in the face, quick cover by Kris but it gets a two. Kris goes for a footstomp but Bito moves, Omukai comes in to kick Kris and Bito delivers the B Driver for a two count. Omukai and Bito both kick Kris, buzzsaw kick by Konami and Omukai nails a Shining Wizard. Bito picks up Kris and nails the BT Bomb, picking up the three count pinfall! Konami, Michiko Omukai, and Yoko Bito win. We have reached the lone title match on the show, and a fitting main event. Mayu Iwatani won the Wonder of Stardom Championship from Kairi Hojo on May 14th, before Kairi left the promotion to join WWE. She then won the World of Stardom Championship in June, so she comes into the match with two singles championships. This is her second defense of the Wonder of Stardom Championship, as she successfully defended it against Hana Kimura on June 11th. Viper has been a regular participant in Stardom but is 0-7 in championship challenges/defenses, as she never seems to be able to win in the big matches. 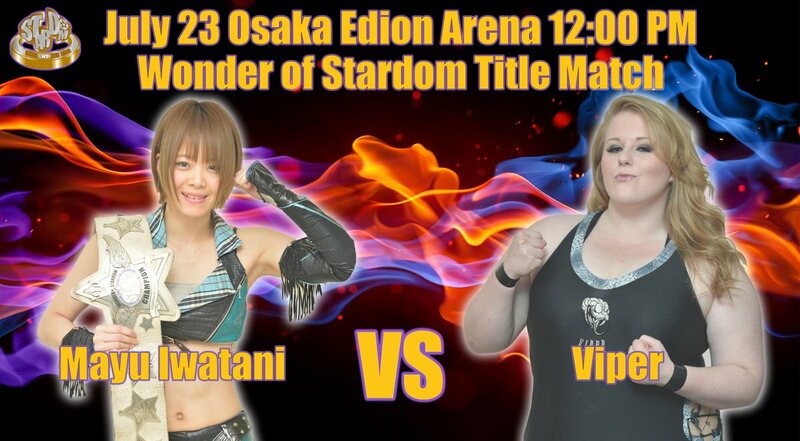 Mayu is looking to cement herself as the new Ace of Stardom, so Viper faces an uphill battle once again to leave the match with a belt around her waist. To help her out, Viper’s new Oedo Tai friends will be at ringside to assist if needed. Mayu tries avoiding Viper to start the match, with limited success, Mayu goes for a scoop slam but Viper easily blocks it. Viper picks up Mayu but Mayu wiggles away, she goes for a crossbody but bounces off of Viper. Running senton by Viper and she throws Mayu out of the ring, where she is beaten down by Oedo Tai. They roll Mayu back in and she is attacked more by all the members of Oedo Tai while the referee is distracted, cover by Viper but she gets a two count. Viper twists on Mayu’s arm and puts her in a cobra clutch, short range lariat by Viper and she covers Mayu for two. Snapmare by Viper and she hits a running crossbody, but Mayu bridges out of the cover. Viper throws Mayu hard in the corner and hits a body avalanche, she goes for a second one but Mayu moves and hits an enzuigiri. Viper doesn’t go down so Mayu goes for a hurricanrana, but Viper catches her and nails a powerbomb. Viper picks up Mayu and throws her head-first into the corner, cannonball by Viper and she goes up for a reverse splash, but Mayu recovers and elbows her back to the mat. Mayu goes up top but Viper joins her, Mayu slides away and she delivers a superkick. Dropkick by Mayu, she goes up to the second turnbuckle and hits a diving footstomp. Cover by Mayu, but it gets two. Mayu picks up Viper but Viper blocks her dragon suplex attempt and hits a Michinoku Driver. Viper gets on the second turnbuckle but Mayu rolls out of the way of the reverse splash, kick combination by Mayu but Viper lariats her when Mayu goes off the ropes. Viper positions Mayu and gets on the turnbuckles again, but Mayu grabs her from behind and delivers a release dragon suplex. Mayu goes up top and nails the Frog Splash, but Viper kicks out of the cover. Mayu picks up Viper but Viper blocks the dragon suplex, superkick by Mayu and she delivers a Reverse Hurricanrana for the three count! Mayu Iwatani retains the championship! For a smaller Stardom event, I have no major complaints. With seven matches, everyone got a bit of a chance to shine, even though most of them hovered around ten minutes or less. I enjoyed seeing Omukai, sure it wasn’t a big match but she still looks great and its always fun to see old favorites. Kyona/HZK was the best match of the show, looking forward to their feud as it ramps up in the upcoming months. The main event was perfectly fine and Mayu showed she is up to any challenge, I just wish it was a bit longer as 12 minutes is pretty short for a major singles title match. A good show for a casual watch, Stardom has a lot of fun wrestlers up and down the card and is positioned to get even better in the future with their young roster.